When I first came across this article I thought it would be a great example of a living laboratory, but after reviewing the information that we had gone over in class (such as Medical Apartheid and Working Cures), I had difficulty in drawing comparisons that would equate our class’s understanding and the article’s view of Living Laboratories. What initially caught my eye about this article was its comment on the long term effects of torture and how tortured prisoners’ pasts have affected their present interactions and health. This reminded me of the rooted distrust that African-Americans had towards western doctors due to the scientific racism and non-consensual experiments African-Americans have been subjected to in the past. Where the difference appears to lie however is between the environments from which the two originate. While the African-American distrust of doctors stems from the non-consensual experiments their people have been subjected to by western medical professionals, the tortured prisoner’s psychological effects stem the non-consensual procedures that prisoners have been subjected to by American torturers. Firstly the idea of “non-consent”: Prisoners do not appear to have consent. The article articulates that consent from prisoners within the parameters of the subject’s torture is minuscule to almost nonexistent. The question that this concept begs is what rights are guaranteed to prisoners of war and how do these rights come into play when subjecting said prisoners to torture? Secondly, the idea of the “unequal power dynamic”: Being that prisoners are prisoners and that they have no power in the environments in which they are held, any experiments or procedures that they are subjected to are completely out of the realms of their control. This feeds into the idea of consent as well. With little to no power, prisoners would appear face the same unbalance of power as would victims of an unregulated living laboratory. And thirdly, the idea of having a “regulated/ controlled environment”: What does a regulated/ controlled environment look like when it comes to torture? Do regulations come into play when torturing a person? How are said regulations decided and executed? What guarantees are there to make sure that the torturer is meeting said regulations? The following cartoon was drawn by politico cartoonist Matt Wuerker following the Flint Michigan Water crisis this past year. 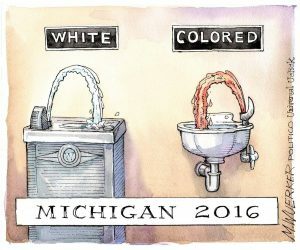 The picture features two water fountains with one labeled “white” and the other labeled “colored” referencing to the segregation that plagued America until the formation of the Civil Rights Act in 1964. The water coming from the “white” water fountain is clean and clear whereas the water coming from the “colored” water fountain is murky and filthy; thereby suggesting the differences in water are designated solely to the races that drink from them. One of the major themes in class that we discussed was the perpetuated interchangeability between race and disease. In John Duffy’s The Sanitarians: A History of American Public Health, the author examines this idea through observation of the interactions between the medical world and people of color throughout history. He goes into detail on the experiences of immigrants who were forced to be “sterilized” with harsh and demeaning treatments upon entrance to America and how such actions perpetuated this association between people of color and disease. The Flint Michigan Water Crisis that Matt Wuerker’s cartoon illustrates reminded me of how this idea of interchangeability between race and disease could still be perpetuated today. The Flint Water Crisis poisoned over 100,000 residents in the Flint Michigan community with 57% of these residents being black. Therefore the majority of patients coming in with illnesses as a result of the infected waters were patients of color. With the sudden influx of sick people of color, one might easily have assumed that the illnesses were associated with the race rather than with the community that the people lived in. This might explain why it took Flint Michigan the amount of time that it did to address the water poisoning and even acknowledge the infected water as an issue in the first place. 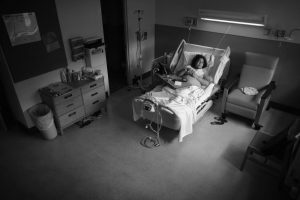 Earlier in April, U.S. News printed an article about the racial disparities that can be found in healthcare. This article was suitably titled “Being Black is bad for Your Health.” In the article, the authors compared two communities; one being an affluent white neighborhood and the other being a primarily poor black neighborhood. The comparison revealed that the community that was primarily affluent and white on average had a life expectancy rate around 10 years higher than that of the community that was primarily poor and black. The differences revealed between the communities did not stop at just the mortality rates, but were also exhibited through rates of obesity, asthma, and teen pregnancy. Some of the major points that were highlighted throughout the article were the differences in healthcare between people of color and their white counterparts. Specifically, the article talked about the comparison between the treatments that white people received from physicians and the treatments that people of color received from physicians. Alexander Green, an assistant professor at Harvard and director of the Disparities Solution Center at Massachusetts General Hospital, studied with other researchers the racial disparities in health and discovered an “unconscious bias” that existed in physician behavior towards their patients. Such behavior seemed to extend as far as physicians suggesting more aggressive medications for ailments such as chest pain to a white patient than they would to a patient who is black. I came across this article as a part of reading assignment that was assigned to me and my classmates in my Freshman Seminar “Is Your Zip Code Your Destiny? Exploring the Social Determinants of Health.” What I found most interesting when reviewing this article was the parallel between the issues that exist in modern day medicine and the issues in historical living laboratories that we have discussed in our Race and Living Laboratories class. What caught my eye in particular, was the noted difference between the recommended treatments provided to black patients and the more aggressive recommended treatments provided to white patients according to Alexander Green and his fellow researchers’ study. This reminded me of the discussion that we had in class about the historical perspective of physicians neglecting to provide blacks with necessary treatments throughout time and in particular when conducting human experimentation on black people throughout history. In an attempt to reason why physicians might not be inclined to recommend aggressive treatments to patients of color, I recalled what we had talked about in class about the acclaimed “scientifically proven” idea in history that blacks have a much higher tolerance to pain that their white counterparts. As we’ve learned in class, this idea was accepted in science as fact and in turn allowed for many scientists, including the notoriously known Dr. Marion Sims, to subject blacks to cruel scientific treatments and experiments. I found it supremely interesting that there might be a connection or perhaps even a paralleled way of thinking between this archaic notion of higher racial pain tolerance and the medical distribution of lesser aggressive treatments based on race. Additionally, I thought about the discussion my classmates and I had in class about Ellis Island and how new immigrants would be turned away from America’s doorstep because they fell under the Class C bloc of access denial. The Class C block was designated for those who, although not sick now, were liable to needing healthcare resources in their future years from the American government. In class we discussed that the idea of rejection based on the probability that one will need support later in life stems from the American perception that there are not enough resources for us all with “us” being defined as American born citizens. Taking this view into context, I can picture how the “unconscious behavior” of the physicians in Alexander Green’s research could be under the influence of this notion when recommending the treatments.